In making Strawberry Nutella Ice Cream, I decided to make strawberry ice cream the base flavor. Using fresh strawberries and its natural juices, I made a standard no-cook ice cream base. Just before the strawberry ice cream finished churning in the ice cream maker, I swirled in warmed Nutella. The mixture is frozen to allow flavors to meld and I recommend not touching the ice cream for at least 8 hours or overnight (patience, my friend!). The result? 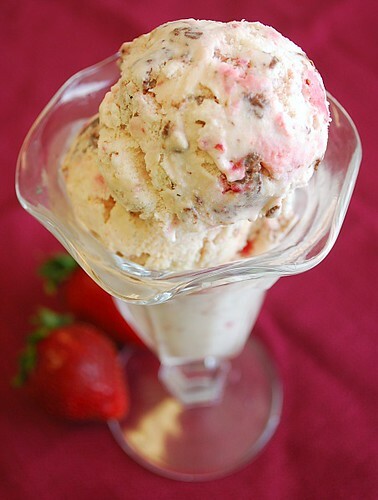 A delicious, creamy strawberry ice cream with bits of fresh strawberries and Nutella swirled throughout. Delish. Combine strawberries, lemon juice, and 1/4 cup sugar in a mixing bowl, set aside in fridge for 1 hour. In large mixing bowl beat eggs until light and fluffy, about 2 minutes. Gradually add 3/4 cup sugar, mixing well. Stir in milk and vanilla and mix well. Add strawberries with juice and mix well. Gently stir in whipping cream just until combined. Pour mixture into ice cream maker and follow manufacturer's instructions. Meanwhile, warm the Nutella in the microwave until it's slightly runny. Just before the ice cream has completed churning in the ice cream maker, slowly pour in the Nutella in a steady stream. 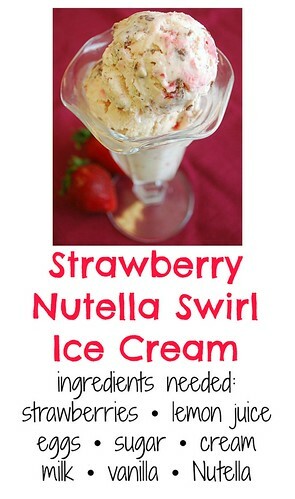 Allow the ice cream maker to swirl the Nutella into the strawberry ice cream. Transfer the ice cream into a freezer safe container and freeze for at least 4-6 hours (overnight would be better) to allow flavors to meld. Ice cream is by far one of my very favorite food groups and this homemade one is looking very delicious! That looks and sounds divine! I've always loved the combination of chocolate and strawberries... but NUTELLA and strawberries??? This may be my new sweet addiciton. I'm definitely saving this recipe. Is it totally crazy that I just tried Nutella for the first time EVER last month???! Where have I been?? I'm trying to decide what type of icecream maker to buy. What type do you have or recommend?